The Caregivers Table is a food-based, teaching and cooking program for bedside healthcare practitioners–- the people who take care of us all. The ones whose jobs don’t coincide with lunchtime self-care programs, or whose own meals are gobbled on the fly, or eaten alone, or come from a vending machine, or don’t happen at all. We offer consultations and custom-tailored educational programs for institutions, departments or wards– everything from 15-minute in-service breaks to conference presentations and day-long workshops. Our programs are anchored in practicality and dolloped with science, nourishment, and fun. We bring practical nutrition and flavorful cooking solutions to caregivers, the how-to-make-it-work in their challenging worlds. The results of our programs? Relief, refreshment, and solid information to improve staff lives. Care for the caregivers. Before I became a chef, nutritionist, and culinary educator, I was that caregiver. I was a critical care Respiratory Therapist in urban trauma centers and understand the physical, mental, and emotional fortitude required to work long hours at the bedside. I get what it means to work short staffed, to think on your feet, to turn on a dime in dynamic and demanding circumstances. I’m very familiar with the downstairs dash, only to find a “closed” sign on the cafeteria door, and the frustrations over limited access to energy-sustaining food choices on the night shift. My mission is to offer practical ideas, easy recipes, and useful solutions that answer the realities of being a caregiver in today’s healthcare environment. Contact me about bringing The Caregiver’s Tables’ nourishing programs to your staff. Catherine McConkie, NC is executive chef for Washington DC’s Center for Mind Body Medicine’s Food As Medicine professional nutrition training program, and chef faculty for CMBM’s comprehensive training program in partnership with Eskenazi Health in Indianapolis. She is founder of The Caregivers Table; an educational cooking program designed to nourish the well being of clinical caregivers, and creator of Come to Your Senses; custom culinary labs that integrate music, movement, and sensory awareness to help teach about food. 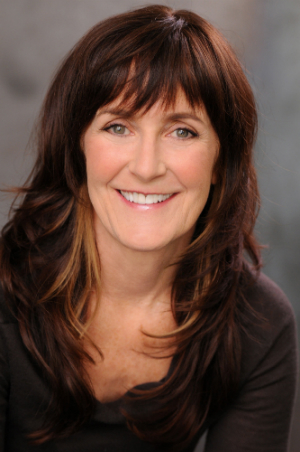 Catherine is core faculty for the Healing Kitchens Institute at Commonweal; lead chef instructor at San Francisco General Hospital’s Wellness Center; and has worked over a decade professionally training students in the culinary arts. 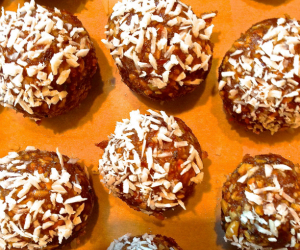 Energy Truffles, one of Catherine's popular healthy creations.